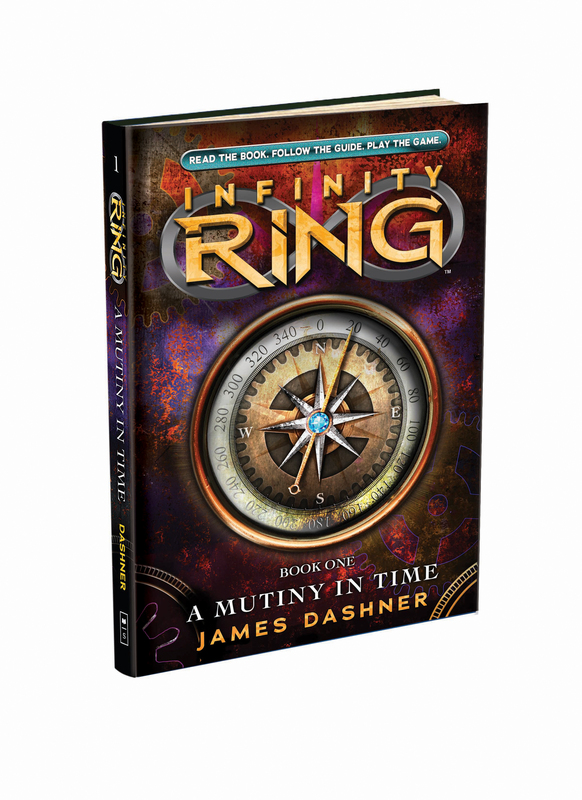 Have you heard about the new Infinity Ring book published by Scholastic? If you are a parent of a child ages 8-12, and you haven’t – chances are you will soon! The Infinity Ring series is an alternate history time travel adventure featuring two very likeable and relatable characters, Dak (a history expert) and Sera (a science expert). In the series of 7 books (to be released through 2012-2014, and written by a series of different authors), Dak and Sera attempt to travel back in time to fix historical events and rescue Dak’s parents (who have become lost in time), using a device called the Infinity Ring. In doing so, they become a part of the Hystorians, a secret society founded by Aristotle to repair these damage historical events. Along the way, they battle the SQ, a group trying to keep history as is. The first series in the book is called A Mutiny in Time, and it is written by James Dashner. This engaging and exciting read are sure to interest your students – but also provide a great way to bring history to life! Here are some great resources that you can use with your students or your children to make connections in both literature and history! * The Infinity Ring Website: You will not be able to tear your kids away! Building on the success of The 39 Clues series, the Infinity Ring website provides an interactive venue for students to engage with the books. The primary historical event that Dak and Sara travel back in time to “fix” in A Mutiny in Time is the voyage of Christopher Columbus. In the “broken” version of history, America was actually discovered by the Amancio brothers, who mutinied against and murdered Christopher Columbus. This book would be a great lead in to a unit on Christopher Columbus. Here are some Christopher Columbus lesson plans to get you started, geared towards middle school students! * Library of Congress Online Exhibit: This link provides a webquest/online field trip experience for students. * Christopher Columbus Recipes: Want to incorporate Home Ec into your Columbus unit? Check out these yummy recipes! * Excerpts from Columbus’ Journal: Primary sources are where it’s at when it comes to standardized testing! Work with students to interpret Christopher Columbus’ own words. Don’t forget to include discussions of Native American protests to the celebration of Columbus Day, as well as a discussion of controversies regarding Columbus’ landing sites, etc! Hopefully, these Christopher Columbus lesson plans have given you a great start! These books sound like a fantastic way to get kids interested in history! And great lesson plan ideas, too! Wow what a great resource that you have provided. Thanks so much for doing this. Loved it so much I shared it on FB. Oh very exciting!!! I love James Dashner books! These sounds great. I’m such a juvenile literature geek! I will probably read them myself even though my oldest is only 2! Me too, Sarah. Having kids is just a good excuse! +1 Mama Games on Google!